The RSF-backed Prema driver made his intentions clear with a bold move on team-mates Brandon Maisano and Felix Rosenqvist at Les Combes on the opening lap to move up into third. The Swede, however, wasted no time in repaying the favour slipstreaming past two laps later just after Eau Rouge, to drop Dennis to fourth just as the first of three safety cars was deployed in the crash-blighted affair. Mucke's Kang Ling caused the first neutralisation after ploughing into Three Bond's Julio Moreno at the Bus Stop. Three laps later - just as racing was back underway - Prema's Ferrari Academy driver and race leader Lance Stroll triggered the second, effectively handing Dennis the win with a mindless move that ended his own race and that of team-mate Felix Rosenqvist and Mucke's Mikkel Jensen. 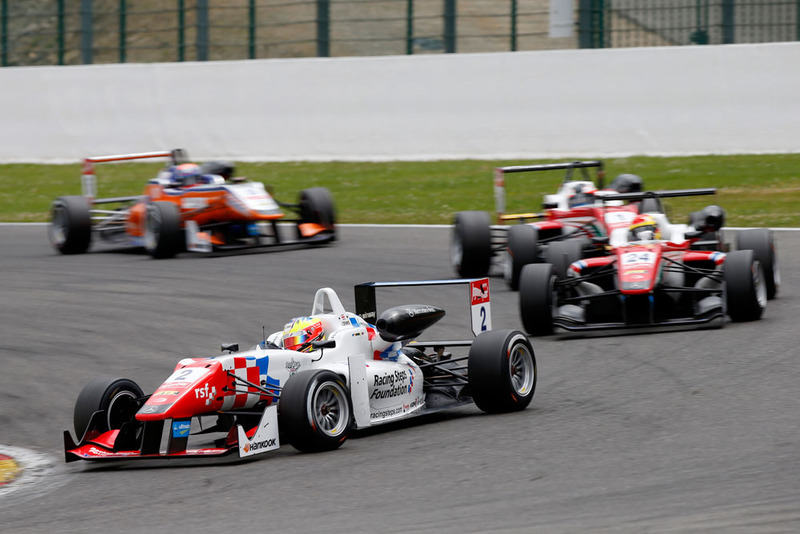 The three were racing side-by-side up the Kemmel Straight as Jensen and Rosenqvist both made moves for the lead which Stroll rebuffed with an impulsive swerve to the left, forcing Jensen into Rosenqvist who was despatched at high-speed into the barriers. The incident - which earned Stroll a post-race appointment with the stewards - left Dennis in the lead and promptly brought back out the safety car. Then, just as racing had resumed for a second time, Carlin's Gustavo Menezes clipped the back of Maisano's car on the approach to Les Combes. The contact flipped the American over and sent him skidding upside down across the track to scramble the safety car for a third and final time while the driver was extricated and the wreckage cleared. In the process the caution handed a much-needed lifeline to Dennis who, by that stage, was beginning to struggle with tyre degradation. The welcome interruption meant he was able to see out the race in relative comfort behind the safety car without having to concern himself with Mucke's quicker, better-shod Santino Ferrucci behind. Sergio Sette Camara followed on behind to claim his first points-paying finish in the series. New points-leader Charles Leclerc finished sixth while closest rival and erstwhile leader Antonio Giovinazzi took ninth. The win for Dennis moves him 18 points closer to the top of the table. He remains fourth in the standings 34.5 points adrift of Leclerc.